DCT Industrial Trust®, a leading industrial real estate company announced today the groundbreaking of DCT Arbor Avenue, a 796,000 square foot development located on 39.6 acres in the City of Tracy in San Joaquin County, in the Central Valley of Northern California. 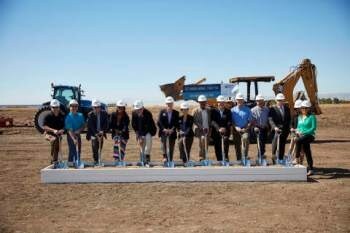 DCT Industrial’s Northern California team hosted a ceremonial groundbreaking on July 6, 2016. The ceremony featured DCT leaders and community officials including the City of Tracy’s Mayor Michael Maciel and members of the City Council. The development is ideally located with easy access to U.S. Interstate 205 and MacArthur Drive, and features a cross-dock distribution building with 32-foot minimum clear height, 195-foot secured truck courts, 118 positions for trailer parking and over 650 auto parking spots. Construction of the facility is scheduled to be complete in Q3 2017.